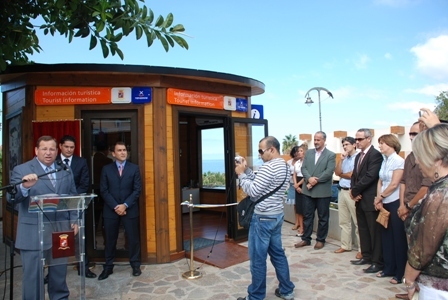 On the 16th of october in los gigantes, the new tourist information office was opened by José Manuel Bermúdez (Vice president of tourism for the cabildo of Tenerife) and Juan Damián Gorrín Ramos from la Villa Histórica de Santiago del Teide. The new toursit information office forms a part of INFOTEN (tourist Information office around Tenerife). José Manuel Bermúdez said that the office will give a quality service to all tourists offering information not only about Los Gigantes but the whole island in general and will be working with other Tourist information offices around Tenerife. Juan Damián Gorrín Ramos also said that he had great satisfaction in the Office being completed as it give tourists a top quality service, he also thanked the Cabildo of Tenerife for there help in improving the image of the whole area . The office is situated in the centre of los Gigantes on the way down to the harbor, there are several personal there who speak various languages including English, Spanish, French, German etc and the information centre also offers Intranet, WIFI, Bluetooth and Skype. This office has everything locals and tourists could need with helpful and friendly advice, as part of all INFOTEN offices around The Island.